Through out the summer tour we asked you - Matchbox Twenty's biggest fans - to submit your concert review from the show you attend on the Matchbox Twenty/Goo Goo Dolls Summer Tour. Check out the winning entries from the first round here. The reviews for the 2nd & final round are in, and the winner's have been selected! Each of you won a New Years Day poster autographed by all the members of Matchbox Twenty! Plus you were each rewarded 500 points to use in the community. Expect your prizes in the mail soon. 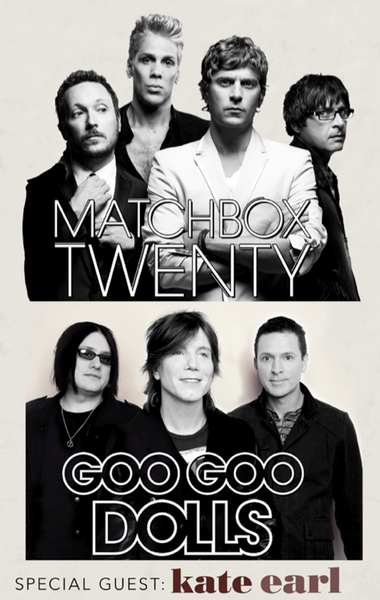 I attended the Matchbox Twenty/Goo Goo Dolls Concert in Charlotte, North Carolina on August 6th, 2013. Let me just start out with this: it was amazing. The whole time I just stood in awe of everyone that performed. I’m pretty sure Rob Thomas looked in my general direction one time and I almost passed out. Kate Earl was very good and the Goo Goo Dolls were awesome, and I‘m glad they joined the tour. However, I was there to see one band and that band absolutely blew me away. This concert is only the second concert I've ever attended (the first was also Matchbox Twenty in Greenville, South Carolina). But I don't need to have gone to many concerts to say that this was one of the best a person could attend. The atmosphere was relaxing and exciting at the same time; the band was introduced with an old-timey video played on the big screens, which was a lot of fun. They started the show with a song and a little introduction about how this concert was a celebration of life and everyone needed to forget their troubles and celebrate with them. I loved that because I definitely need a break from the real world sometimes. It was such a perfect way to start a concert, especially a Matchbox Twenty concert. I say this because this music makes you think, there are lessons here if you only listen for them. I’m not a very emotional person, yet I feel so much when listening to this band’s music. The concert would’ve been great for anyone. I don’t know why a non-fan would go, but if they had I’m positive they would’ve had a great time. No one dislikes Matchbox Twenty. It’s just not how the world works. Their music unites people and they make it seem easy. The cubes, the lights, and the sound were all spectacular! And they played so many songs! I don’t know how Rob Thomas does it, singing that much all the time. But I (and many others) are so glad he does, his voice is like no one else’s and his dance moves are pretty great as well. All of the band members seemed fresh and really looked as though they were working hard to put on a good performance for their fans. Paul Doucette and Brian Yale were awesome, you could tell they were both really getting into the music. And Kyle Cook just seems like a cool guy and a great guitarist. But I mean, they all seem pretty cool. But for the encore, one of the songs the band sang was “Jumpin’ Jack Flash” and Kyle Cook came out with a cigarette on his guitar (as a tribute to Keith Richards, maybe) and he just killed it. I could say so much more about these people and this concert, but I won‘t go there because I feel as though I‘ve already written a lot. The band is great, they all seem like genuinely nice people who try really hard for their fans. The concert was the best event I’ve ever attended in my 19 years of life and I wish to attend many, many more of them. Every song was well done and I thoroughly enjoyed the set list. I hope the members of Matchbox Twenty know how much I appreciate their sacrifice and know how much their music means to me (I listen to it every day and love it just as much as the first time I heard it). As long as they’re going on tour, I’ll be there. Since I’m a self-proclaimed concert/live music junkie, I’ve attended a few concerts this summer. The Matchbox 20/Goo Goo Dolls concert was one I was extremely looking forward to attending. I was fortunate enough to see Matchbox 20/Goo Goo Dolls two times this tour. My first concert was in Camden, NJ. Having been a major fan for years this was truly the experience of a lifetime. Two of my absolute favorite bands playing together in one venue – this was perfection. It didn’t matter what seats we had in the venue (albeit ours sucked) since lead singers John Rzeznik of the Goo Goo Dolls and Rob Thomas of Matchbox 20 gave such an amazing performance. Their crystal clear vocals resonated and the instrumental composition of old favorites and newer hits could be heard regardless of where you were in the venue. This concert left me wanting more, and I couldn’t help myself so I made sure that I attended their next show in Hershey, PA. My best friend came to Hershey with me and disclosed that she did like the bands but she wasn’t to the caliber of fan that I was, despite this she agreed to make the trek with me. I promised her a promise that I knew I could keep; this would be a show that would definitely not disappoint. We listened to the opening performer Kate Earl with her beautiful vocals and incredible range followed by the Goo Goo Dolls who once again gave an incredible performance. It was great to rock out and sing along to hits like Name, Black Balloon, Slide, Iris, January Friend– I could go on. Also, they were thoughtful enough to teach us the lyrics to the newest hit Come to Me. Already on a high from the Goo Goo Dolls, you could start to feel the energy intensifying as it came closer to the start of Matchbox 20’s performance. The opening to Matchbox 20 was climactic – especially for those who knew what was about to come. A short video introduction then pitch black silence. Suddenly, I felt the rise of goose bumps on my arms when hearing the rhythm of Kyle Cook on lead guitar. The opening song was Parade, the words of which struck a chord since I knew what I was feeling at this concert unfortunately wouldn’t last. After a few amazingly performed favorites, lead singer, Rob Thomas told us to let go of everything for just one night I heeded his advice and I forgot about the pile on my desk, issues at work, with family, and took those few short hours and enjoyed the moment, the music, the happiness of everyone around me enjoying a magnificent performance. Unfortunately, time went by all too fast when the music played. With each song the intensity climbed higher and higher and MB20 had us wanting more. The performance was amazing; every member of the band gave it their all. Paul Doucette poured his high energy performance into his guitar and then on drums for Back to Good. The set design beautiful and the light show just added an extra something to make the show even more captivating (as if that were possible). Even though I’m middle aged, that night I channeled my inner teenage self and enjoyed screaming, jumping and dancing to the rhythm of their music. I absolutely lost all my inhibitions and was singing to all the songs at the top of my lungs (my apologies to those around me for my horrible voice) but that night I felt like we could all sing together and I was in harmony. After an hour and a half packed with musical (ok I’m going to say it) – brilliance, MB20 took a break and provided an encore that had as much energy if not more of the first set. Their rendition of an INXS, Don’t Change was right on, this was followed by two tremendous hits, Back to Good and Push. I left that concert, my second for MB20 that week and was salivating for more. It was truly amazing experience, one that I will never forget. It appears my friend, the one who wasn’t a big fan, won’t forget it either since she started sending me videos of her new favorite song, She’s So Mean which she reports is on constant replay. Fantastic.